The April 6 movement has chosen Amr Ali as its new head, succeeding founder and long-time leader Ahmed Maher. In the group's first elections since its launch in 2008, they chose Amr Ali, co-founder and member of the organisational committee, with almost 56 percent of votes. The results were announced in a press conference Monday, a week after the elections took place. Maher, who has been the leader of the group for almost six years, did not run in the elections, choosing instead to take on an advisory role. He is expected to join a council of elders, to be elected soon. 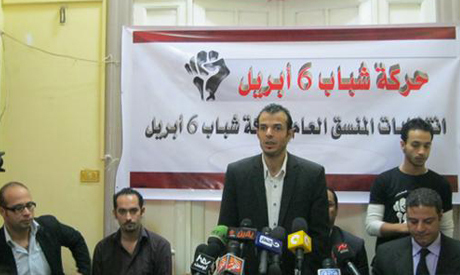 The April 6 Youth Movement was founded in 2008 to support protesting workers in the Nile Delta's Mahalla. It soon developed into one of the leading oppositional movements during the Mubarak era. However, the group has recently lost much of its popularity due to the emergence of alternative oppositional movements and a spotlight on the group's allies and funding sources. Ali said he intends to make changes to the movement in the coming period, in order to regain its popularity on the street. "However, the group's basics and principals will remain untouched," he told Al-Ahram's Arabic news website in his first interview after the elections. The group's new leader said the movement will not join parliamentary elections, because it does not aspire to formal political power. However, it will support various "revolutionary figures" running in the elections. Ali acknowledged the group had experienced internal conflict, but maintained, "confusion was not limited to April 6; the street was deeply polarised in the recent transitional phase, which directly impacted revolutionary and political forces."